Mitsubishi Ductless Heat Pumps are a highly efficient heating and cooling system that are extremely quiet and provide comfort or homes without the use of duct work. Perfect for applications with baseboard heaters, wall heaters, or additions and bonus rooms without duct work, these systems can save up to 50% on your energy bills! 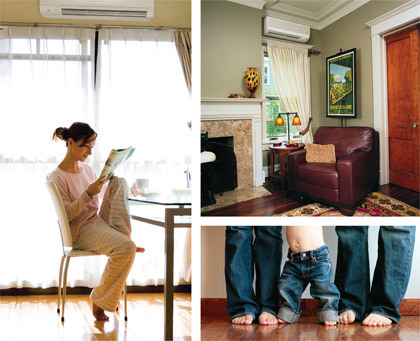 A Portland ductless heat pump is a highly efficient heating and cooling system. As a primary heat source for electrically heated homes (baseboards, cadet wall heaters, etc. ), these systems heat and cool homes at a fraction of the cost! Ductless heat pumps are much safer to than electric heaters, are much quieter, and heat rooms evenly (no more hot and cool spots). What Are the Components of a Mitsubishi Ductless Heat Pump System? 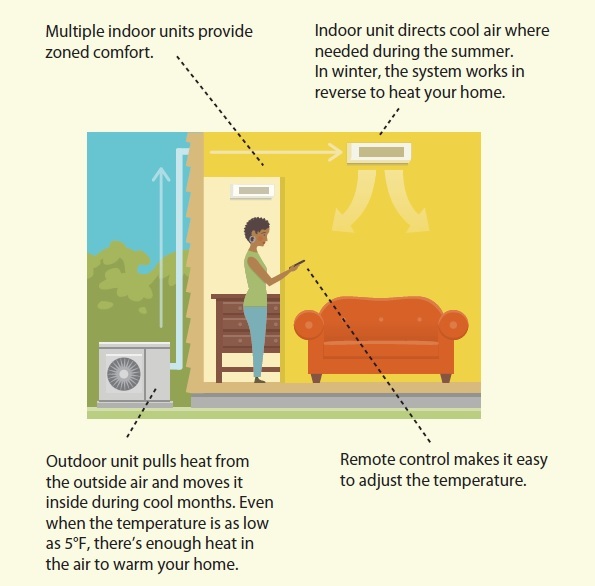 A heat pump transfers heat using refrigerant expansion and compression within a cycle...in other words, it takes the temperature of the cold air from the outside unit to make your home warm - and takes the warm air temperature from the outside to make your home cool. In the visual on the right, you can see that the outdoor unit pulls the heat from the outside air and moves it inside during the cooler months. From there, the indoor unit directs the air where you'd prefer it to go, and works with the fan speed to have the air reach as far as across the room using the hand held remote. 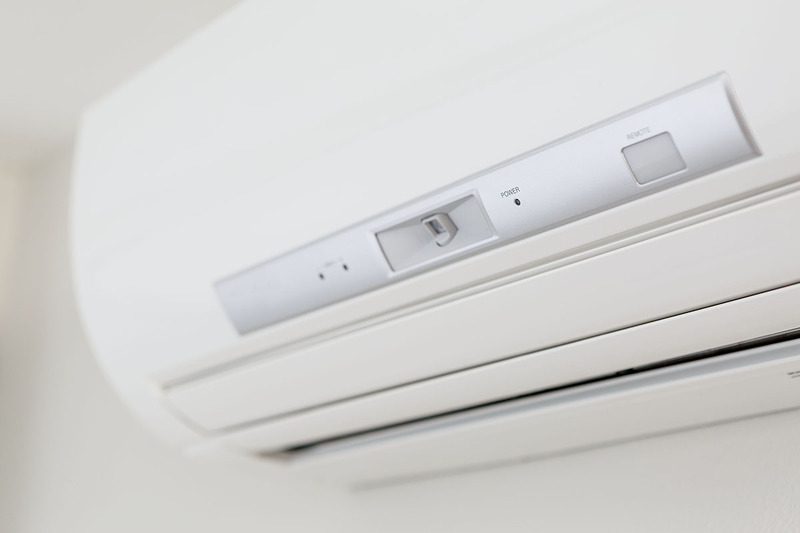 It may seem backwards to some, but Portland ductless heat pump systems are meant to operate constantly in order to maintain the preferred temperature and improve efficiency. For example, consider a car driving down the highway - a car's gas mileage is much better on the highway because the car is moving for an extended period of time while using less gas per mile. If that car was in town, starting and stopping at every light, that car's gas mileage will suffer because of the constant starting and stopping, not to mention the extended amount of time it will take to reach the destination. i-see Sensor 3D. This indoor sensor (located on the front of the indoor unit) has the ability to sense if the room is empty or occupied and determine if the heat pump should run at a higher or lower speed. That way, you are not paying to heat/cool an empty room, but you are able to maintain the efficiency and comfort once that room is occupied. Your Portland ductless heat pump may have an AUTO mode that allows the system to switch between heating and air conditioning automatically. However, our repair and installation service experience in the Northwest suggests this setting does not provide the most efficient and responsive operation. Instead, try setting the system control to the HEAT mode (or heating symbol) during the heating season and to the COOL mode (or the cooling symbol) when you want air conditioning. The AUTO fan speed setting (or auto symbol) is preferred over the other settings (usually quiet, low, medium and high) because as indoor and outdoor conditions change, the unit automatically uses the optimal fan speed. Depending on the location of your ductless heat pump, you may need to set the unit's temperature slightly higher or lower than the desired temperature in the room to find a setting that's comfortable. Think of the temperature set on your remote as a comfort setting rather than the exact temperature that you want. Ductless heat pumps are designed to adjust to changing conditions automatically and efficiently. Once you find a comfortable temperature setting, avoid changing the setting or turning off the unit. The unit will run most efficiently if it is allowed to ramp-up and down to meet your heating and cooling needs. It is very likely that a ductless heat pump can provide efficient heating to more of your home than just the room in which it is located. The total area served by the heat pump is called the "effective zone". In general, a larger effective zone will allow the unit to provide more benefit to you by efficiently heating more of your home. To maximize the benefits of the ductless heat pump, it should be used as the primary heating system in the effective zone, leaving the existing heating system used primarily has the "back up". In extremely cold conditions, the heat pump may not provide desired comfort levels to all areas of the effective zone. In this instance, the effective zone should be temporarily reduced by closing doors to unused portions of the house. Heating during periods of cold weather will cause the coil on the outdoor unit to accumulate frost. Don't worry, this is normal. To allow continued, efficient operation, the ductless heat pump is designed to "defrost" itself automatically. The defrost mode typically takes 5 to 15 minutes to remove frost from the coil. Once the function is complete, the system will return to its heating operation..
Multi-zone systems provide two or more indoor units with the use of only one outdoor unit. These systems allow you to set the indoor units at different temperatures. However, the entire system must operate in the same mode (Heat or Cool). If you have any additional questions or concerns regarding your ductless heat pump, please give us a call at 503-579-2250.